Normally, when you suffer from a pulmonary embolism—a blood clot blocking the flow to your lungs or heart—you've only have two options; undergo chest-cracking open-heart surgery, or die. But thanks to an ingenious new blood filter system, doctors will be able to save lives without destroying sternums or requiring weeks of recovery. 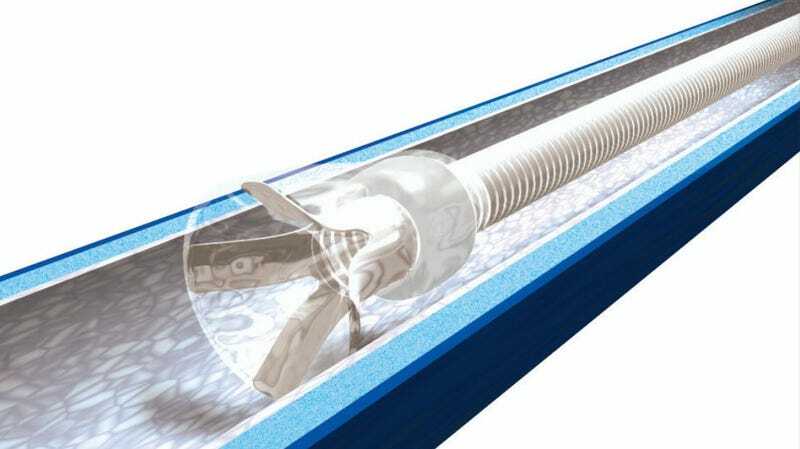 If you combined a Dyson vacuum with a dialysis machine, you'd have a rough equivalent to the AngioVac system from Angio Dynamics, a New York-based purveyor of bleeding edge medical equipment. The system essentially hoovers out your blood, filters it for clots, and pumps the cleansed blood back into your body, minimizing the need for transfusions. The system consists of a cannula and circuit, designed by Angio Dynamics, as well as a number of third-party components like the pump and filter. The cannula is serves as the outgoing pipe. It's inserted into the carotid artery and is threaded through your vascular system into position on one side of the clot. The other end of the cannula is attached to a powerful fluid pump via an inline filter. The pump is switched on, sucking the patient's blood through the cannula, then the filer, then through the Angiovac circuit that is inserted into the femoral artery and back into the patient's body. This effectively bypasses the circulatory system and is known as an extracorporeal bypass. The AngioVac has already been credited with saving at least two lives. Todd Dunlap, a 62-year-old Southern California resident became the first person in the state to successfully undergo the procedure on August 8th when a medical team from Ronald Reagan UCLA Medical Center sucked out a 24-inch clot that stretched from his legs into his heart. The team, guided by an esophageal camera, insterted the cannula into Dunlap's neck and positioned it next to the clot in his still-beating heart. They then slid the circuit into his femoral vein and turned the suction on. Just three hours later, the clot had been fully exorcised. Dunlap was out of intensive care within three days and discharged completely within the week. Had doctors cracked his chest and performed open heart surgery, he would have been looking at six hours under the knife, weeks in the hospital (barring any secondary infections), and months of recovery. "Retrieving a clot from within the heart used to require open-heart surgery, resulting in longer hospitalization, recovery and rehabilitation times compared to the minimally invasive approach provided by the AngioVac system," said Dr. Murray Kwon, a UCLA cardiothoracic surgeon who collaborated on Dunlap's procedure, in a press statement. Similarly, Detroit-area doctors were recently able to remove a massive clot straddling Mary Murphy's lungs. “Last week’s successful deployment of the new AngioVac Cannula [catheter] at the DMC marks a major step forward for patients who are struggling with pulmonary embolisms [blood clots in the lungs] and other types of cardiovascular blockages,” said Theodore L. Schreiber, M.D., the President of the DMC Cardiovascular Institute (CVI), said in a press statement. Specifically, Murphy had suffered a “saddle pulmonary embolism,” wherein the blood clot balances on either side of where the pulmonary artery splits into two branches, one for each lung. But like Dunlap, doctors quickly and easily positioned the cannula next to the clot and removed it in less than an hour.